There were about 80 of us gathered this weekend from Maine and other New England states at a gay bar in Ogunquit to get trained for canvassing in communities for the ‘No on 1” campaign. Question 1 on the ballot would override the state legislature’s vote which was signed in to law by the governor to legalize marriage equality beginning Jan. 1, 2010. 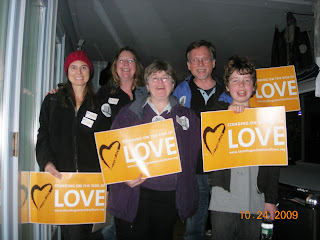 A group from my church—First Parish Cambridge UU—joined the volunteers, wearing our ‘No on 1’ stickers and Standing on the Side of Love pins, and carrying our Standing on the Side of Love signs. The organizers from Maine Equality loved our signs and asked if they could have some for the office along with a stack of buttons. I canvassed with my husband and my 11 year old son. Most of the people we spoke to were voting No on 1 and so our job was to ask them to vote absentee before Election Day and to recruit them as volunteers for the campaign. We also encountered a few people who are voting against us—although they were very nice as they told us they were voting to take away people’s rights(!). We didn’t meet anyone who is still undecided. The polling, however, shows a dead heat between yes and no voters, with 4% still undecided. It is absolutely critical that we do all we can to defeat this ballot initiative. Along with canvassing, our congregation’s youth group and others are phone banking at the Mass Equality headquarters this weekend. The most moving part of the weekend for me was in the training and debriefing of the canvassers. When the organizers asked if any of the couples in the room were married, we of course raised our hands, as did another straight married couple, and about a half dozen gay/lesbian couples who shouted out the states they had been married in – mostly Massachusetts and CA (while it was legal). It hit me profoundly how I so take for granted the right to marry. I was inspired by the people in the room who were brave and determined enough to go out into neighborhoods where they were bound to hear people tell them why they should not have this right or be treated as equals (or worse). My family felt proud to be standing on the side of love with these courageous folks. It was definitely one of the liveliest trainings I have attended and the role play between ‘Casey Canvasser’ and ‘Valerie Vixen Voter’ deserved to be on stage! The debriefing included stories that needed to be ‘shaken off’ as people reported some of the hostility they encountered and it was another moment of recognizing the privilege I experience as a straight person. There were also wonderful stories including one about a woman who identified herself as born again Christian and felt that Jesus just wants us to love and that’s why she’s voting No on 1. The camaraderie and the compassion we witnessed this weekend were truly inspiring. My son is now more outraged and determined to work for equality than he has ever been simply from our kitchen table discussions. The experience of coming together—gay and straight—to protect marriage equality had us all feeling and witnessing the power of love to stop oppression.